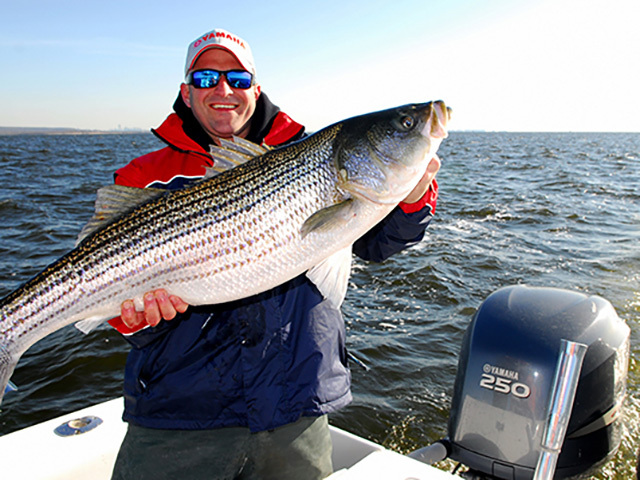 How to fish the Mid-Atlantic spring striped bass bite..
As inshore water temperatures rise, spring striper fishing should start firing up in Mid-Atlantic inshore waters. Fresh clam on a circle hook might not look too appetizing, but in cold, dingy water it's just what the striper ordered. This fish is representative of a nice spring bass taken on a clam. This schoolie striper was caught by trolling with deep diving plugs. Capt. Frank Crescitelli of Fin Chaser Charters on Staten Island with a clam-caught schoolie striper, typical of the size that winters over in estuary waters. It's been a brutal winter for most of the Mid-Atlantic states, with record low temperatures and an amazing amount of snow, sleet and freezing rain. 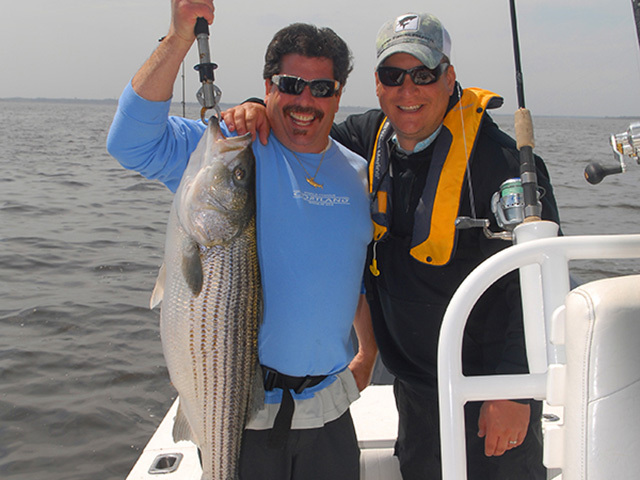 Just what does that mean for spring striper fishing? If past experience is any indicator, fishing might get off to a slightly later start. Spring snow melt will bring a rush of cold water pouring into the bays where the first bass of the year are usually found. All that extra fresh water will probably be carrying more silt, which could hinder water clarity and affect feeding preferences, but that can be accounted for with the right techniques. 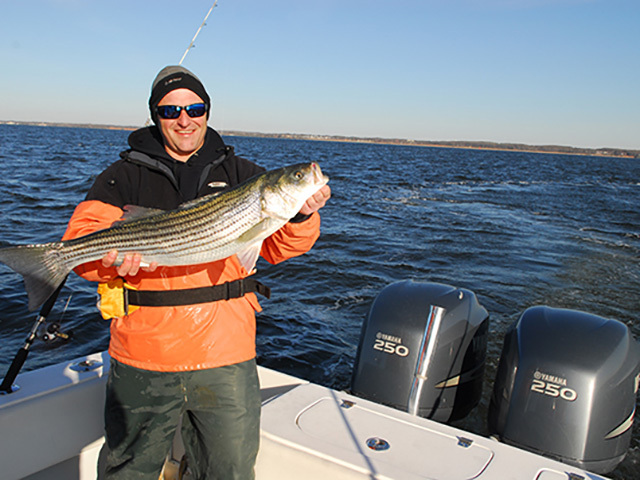 A look back in our fishing logs reveals that striped bass fishing after cold winters has been as good if not better than during mild years. So if you haven’t gotten to it already, you better start getting the boat and tackle ready. Extreme cold water temperatures in rivers and estuaries where small-to-midsize stripers reside can put them in near hibernation throughout much of the winter. When the first hints of spring make an appearance—the sun gets a little higher in the sky, the days get a little longer, air temperatures start to rise—the bass stir and start to get hungry. If you’re willing to brave the weather and get on the water, chances are you’ll be rewarded with some decent fishing action. These baits are fished on or very near the bottom, and light spinning or baitcasting outfits filled with 10- to 15-pound test line are more than adequate. The preferred bottom rig is a simple fish-finder type, with a light bank sinker mated to a 24-inch fluorocarbon leader armed with a 4/0 or larger circle hook. Using circle hooks is important because stripers feeding on soft baits are likely to swallow the hook in the time it takes for you to realize they are mouthing the bait. Circle hooks almost always set in the corner of a fish’s mouth, making unhooking and releasing them easier for you with less potential to harm the fish. That reduces release mortality of young fish or any fish you catch over the bag limit. If you’re using worms, the addition of a small float between the hook and the sinker will help keep the bait off the bottom and attract more bites. Clams give off more scent and are easier for bass to locate and gulp down lying on the bottom. 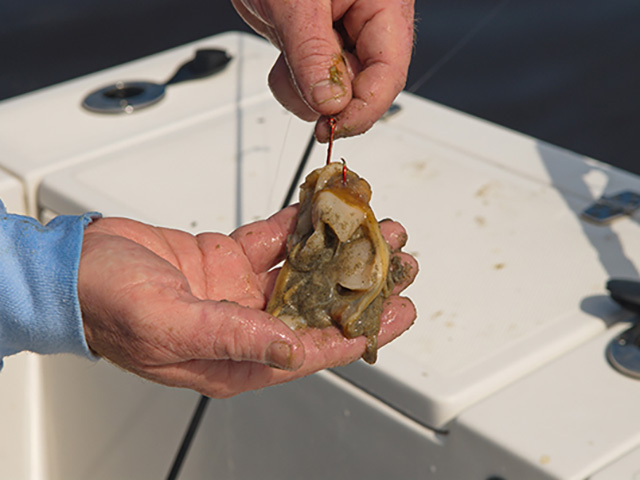 When clam fishing, bring along a chum basket and fill it with crushed clams, then suspend it on the bottom under the boat to disperse even more scent to attract bass from further away. Trolling these plugs can be done on a variety of light conventional rod and reel combinations, but be sure they are loaded with 30- to 50-pound test braided line. The thin braid allows these plugs to dive to their rated depth. Add a six-foot fluorocarbon leader and a snap for changing lures quickly, and fish them from outrigger-type rod holders to keep them spread apart behind the boat. Be sure to keep your eyes on the depthfinder to locate schools of baitfish, and to watch for stripers. That way you can be sure you’re fishing in the right places and using plugs that are running at the depth the fish are holding. You should have plugs in a range of colors that run at a variety of depths. 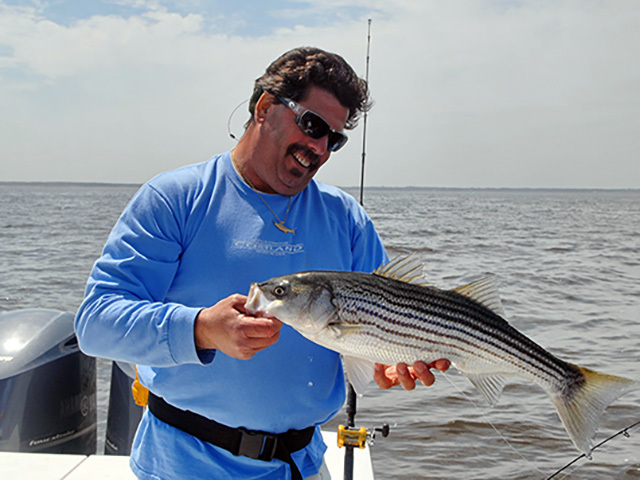 If you are not familiar with where to hunt for early season stripers, be sure to review charts of the estuary you’re planning to fish, and look for areas adjacent to where feeder streams and rivers enter the bay. Then look for areas of flats along channel edges, especially flats that get exposed to the most sun during the days as they will warm faster, as warmer is better this time of year. In a lot of cases, flats along shorelines with southern exposure will fit the bill because the sun is still in the southern sky and will strike those flats with the most direct light. You can find stripers in water depths from a few feet out to edges of channel drop-offs in 20 to 30 feet. Bottom fishing with soft baits will often be best on flats near drop-offs. Anchor the boat upcurrent of the drop, and set out a chum pot with clams or just cast your bait behind the boat and let the fish come to you. Time your fishing to coincide with the top of the incoming and first few hours of the outgoing tide, when bass will be most active. This way the current carries the scent of your baits to deeper water, and the fish will be working into the current for just that reason. Pay attention to tides when trolling with plugs, too. High tide stages will produce the most bites.